You will create your very own WordPress website! Do you want to learn WordPress website development in just two days? That too, without having to learn coding and programming? If the answer is yes, then you have landed at the right place. We at Learning Skills bring you WordPress Training Online that’s designed for anyone with basic knowledge of computers and Internet. The WordPress CMS (Content Management System) is the most popular CMS in the world. More than 25 percent of all new websites are created in WordPress CMS. It is flexible, user-friendly, affordable, scalable, robust, and efficient in comparison to all other CMSes. Also, many large brands and companies are using WordPress CMS for their websites. That’s why it becomes too important for anyone entering Digital Marketing and IT or even starting a business to learn WordPress website development. 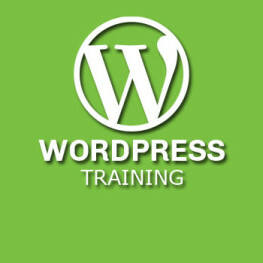 Our WordPress Training Online gives you the opportunity to learn Website Development at your convenient time and space. You can access our online content on the go through the Smartphone or Tablet. Or anytime during through your laptop or desktop at your home or office. The aim of the course is to help you learn WordPress website development without having to put in much effort that too in less time. In our WordPress Training online, we ensure that within a limited period (10 hours approx.) you will learn to develop a full-fledged and professional website. In this WordPress Training Online, you will be designing and developing the live website without even having to write a single line of code. You will not find such WordPress Training Online anywhere, where you get personalized learning experience. From the start, expert WordPress trainer will guide you throughout the process. On developing your website on the chosen domain name in the classroom. So, who should attend this WordPress Training Online? Our WordPress Training Online is open for anyone, who wants to learn to develop a Professional WordPress website that too without having to learn and write codes. With fun and engaging online learning experience, we ensure that you learn and enjoy all training sessions with us. If you happen to stay in Delhi or around Delhi NCR region you may feel free to visit our office near Delhi University North Campus. On our page ‘Institute Digital Marketing’ we regularly share tutorials on WordPress and Digital Marketing. Follow us to explore. Learn to develop a professional WordPress website without having to write a single line of code!